Virtual Memory - Also referred to as "swap space", Virtual Memory is free hard drive space that can be used as extra memory for a computer. Virtual memory is much slower than physical memory (RAM). Virus - A Computer Virus is a program that can copy itself and infect a computer without the permission or knowledge of the user. A Computer Virus has 2 major characteristics: the ability to replicate itself, and the ability to attach itself to another computer file. Every file or program that becomes infected can also act as a Virus itself, allowing it to spread to other files and computers. The term "computer virus" is often used incorrectly as a catch-all phrase to include all types of Malware such as Computer Worms, Trojan Horses, Spyware, Adware, and Rootkits. There are many different anti-virus programs available to prevent and remove viruses. Since new threats are created almost constantly, it is important to keep the virus definition files updated for your software. 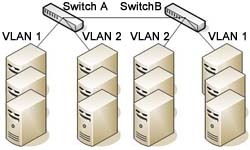 VLAN (Virtual Local Area Network) - A VLAN is a logical grouping of devices or users. These devices or users can be grouped by function, department application and so on, regardless of their physical segment location. VLANs create separate broadcast domains in a switched network. Frame tagging at layer 2 does this. Frame tagging is a gaining recognition as the standard for implementing VLANs, and is recognized by IEEE 802.1q. Frame tagging uniquely assigns a VLAN ID to each frame. This identifier is understood and examined by each switch prior to any broadcasts or transmissions to other switches, routers, and end-stations devices. VNC (Virtual Network Computing) - VNC makes it possible to interact with a computer from any computer or mobile device on the Internet. Unlike Microsoft's RDP, VNC offers cross-platform support allowing remote control between different types of computers. Popular uses for this technology include remote technical support and accessing files on one's work computer from one's home computer, or vice versa. VOIP (Voice Over Internet Protocol) - Also known as Internet Telephony, VOIP is the technology that allows voice traffic to be transmitted and routed over a data network using the Internet Protocol. The advantage of VOIP is that it is low cost (in some cases free) in comparison to using tradition POTS (Plain Old Telephone Systems) for voice communications. Companies such as Vonage and Comcast Cable are currently offering VOIP phone services and Skype is a freeware program that provides free long distance communications with other Skype users. VPN (Virtual Private Network) - A VPN is a network that uses a public telecommunication infrastructure, such as the Internet, to provide remote offices or individual users with secure access to their organization's network. A VPN works by using the shared public infrastructure while maintaining privacy through security procedures and tunneling protocols such as the Layer Two Tunneling Protocol (L2TP) or PPTP. In effect, the protocols, by encrypting data at the sending end and decrypting it at the receiving end, send the data through a "tunnel" that cannot be "entered" by data that is not properly encrypted. VRAM - Video RAM. This type of memory is used on video adapters, and is dual-ported, meaning that it can be accessed by two devices simultaneously. This allows the monitor to access the memory for screen updates, while at the same time allowing the graphics processor to provide new data. VRAM is no longer to be found on new devices; it was rapidly superseded by SGRAM and then DDR-SDRAM. VRML (Virtual Reality Modeling Language) - VRML allows the display of 3-D vector objects within a web browser with the installation of a plug-in. VRML is a text file format wherevertices and edges for a 3D polygon can be specified along with the surface color, image-mapped textures, shininess, transparency, and so on. VRML files are typically referred to as "worlds" and use the .wrl file extension.